What Else Can I Expect From an Online Bachelor's in Healthcare Management Program? The broad, multidisciplinary field of healthcare management covers the leadership, administration, and day-to-day operations of hospitals, clinics, and other medical facilities, along with healthcare providers and networks. Managers in this profession oversee staffing needs, supply inventories, equipment maintenance and sanitation, along with recordkeeping, billing, and insurance processes. According to the Bureau of Labor Statistics (BLS), the healthcare management industry is expected to grow considerably in the years to come. The job growth projections for positions like medical/health services managers and medical records/health information technicians are projected to rise by more than 15% through 2014. Most careers in healthcare management are attainable with a bachelor's degree in the field or other related disciplines, such as public health or health services administration. Healthcare management curriculums touch on the various duties and expectations employees have in this field. Many healthcare management programs feature required or optional practicum courses, which allow students to receive onsite training from experienced professionals and to apply their new skills in a practical setting. Today, many students are choosing to earn their bachelor's degree in healthcare management online. Web-based programs follow the same rigorous curriculum as brick-and-mortar modules, leading to the same number of job opportunities for online learners after graduation. The asynchronous format that most online healthcare management degree programs use is also ideal for students with young children, part-time jobs, or any other commitments that may make it difficult to attend class on campus. Read on to learn more about what you will learn in a healthcare management program, and what kind of career opportunities you can look forward to upon graduation. With a healthcare management degree, you can help manage the day-to-day operations of hospitals, clinics, and other medical facilities. Read more here..
IS A HEALTHCARE MANAGEMENT DEGREE WORTH IT? Yes. This field is highly competitive, and degree-holders can expect their salaries to increase roughly 70% by the time they are mid-career professionals. Read more here..
WHAT IS A HEALTHCARE MANAGEMENT DEGREE? A health care management degree prepares graduates to pursue a variety of administrative roles at hospitals, clinics, and other healthcare facilities. Read more here..
A health care manager oversees a variety of operations -- such as staff needs, supplies, sanitation, billing, and insurance -- at healthcare facilities. Read more here..
CAN YOU BECOME A PA WITH A HEALTHCARE MANAGEMENT DEGREE? On its own, a healthcare management degree is not sufficient for becoming a physician assistant. PAs must have a background in the medical sciences and need to possess advanced education and certification. Read more here..
WILL AN ONLINE HEALTHCARE MANAGEMENT DEGREE PROGRAM PROVIDE ME WITH THE SKILLS I NEED TO ADVANCE MY CAREER? An online bachelor's in healthcare management will cover the basics of administrative tasks like patient billing, coding, and record keeping. Courses also discuss cleanliness and sanitation protocols, patient confidentiality, and other dimensions of medical law and ethics. Additionally, practicum courses build on coursework with hands-on training, giving students a realistic look at the workplace conditions and responsibilities they will have on the job. WILL AN ONLINE HEALTHCARE MANAGEMENT DEGREE PROGRAM WORK WITH MY SCHEDULE? An online bachelor's degree in healthcare management offers a flexible alternative to campus- based education. Students can access course lectures and readings, participate in class discussions, submit written assignments, take exams, and communicate with their professors on their own schedule. Current educational technology also enables them to study away from their home computer using a laptop, tablet, smartphone, or other Wi-Fi-compatible device. Conveniently, online students can also usually arrange practicum courses at local hospitals, clinics, or other sites near their residence. WHAT JOBS CAN I GET WITH MY BACHELOR'S DEGREE IN HEALTHCARE MANAGEMENT? Online students who graduate with a bachelor's in healthcare management will be eligible for most entry-level positions in the field, including some managerial roles. Specific positions include medical records and health information technician, medical and health services manager, administrative services manager, and billing/coding specialists. In some of these occupations, employers prefer candidates who have earned a professional license or certification; the best online healthcare management degree programs will provide students the knowledge and skills they need to earn these additional credentials. WHAT ARE THE BEST ONLINE HEALTHCARE MANAGEMENT DEGREE PROGRAMS? Choosing a program is a very personal decision, and only you can properly evaluate whether a target school's strengths match your educational needs. The following ranked list of schools should serve as a helpful starting point in your search for the best online healthcare management programs in the United States. 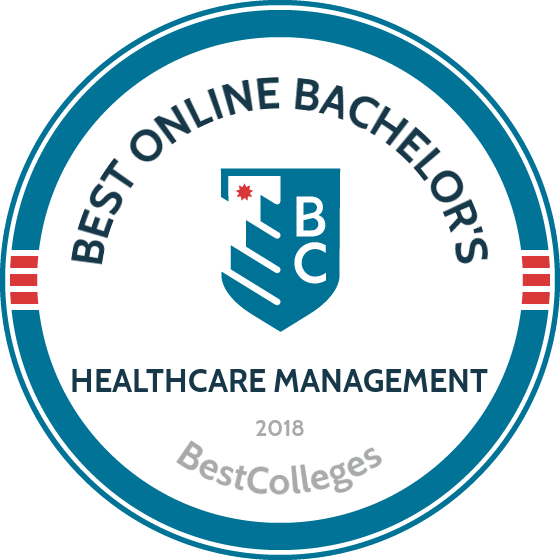 If you want to work in healthcare, and you value the opportunity to study online, read on to learn more about the top online healthcare management programs in the country. CSU-Global organizes a healthcare management degree online program through its Greenwood Village campus that teaches the skills needed to succeed in healthcare administration. Students practice marketing, human resource management, and communication aptitudes sought by top employers. Classes for this degree, available online in an asynchronous format, allow candidates to study where and when they prefer. The university helps online students succeed with a variety of support services. Academic advisers help students plan coursework to match their educational goals and develop strategies for learning in a self-motivated online environment. Students who seek extra instruction can access online tutoring services all hours of day or night. Technology support experts work with online students to overcome technical difficulties. Career advisers guide degree candidates as they transition to professional roles. This bachelor’s in healthcare administration and management requires students to earn 120 credits to graduate, normally in four years of full-time study. Candidates learn about the general structure of the healthcare system in the United States. Core classes cover accounting, insurance, human resources, risk management, and population health. Students explore current topics in healthcare policy through capstone courses. Students in this program use elective credits to choose specializations or explore multiple topics of interest. Candidates may also choose to participate in practicums to gain real experience in health-related organizations. Students who wish to continue to the master’s of healthcare administration and management program at CSU may complete this program on a dual enrollment basis, meaning they can earn undergraduate and graduate credits concurrently. This program normally accepts candidates with at least 12 credits from other regionally accredited institutions and a GPA of 2.30 of higher. However, the university allows new freshman candidates to apply with high school transcripts proving a GPA of 3.2 or better and competitive ACT or SAT scores. First-time freshmen who do not meet these requirements may submit resumes showing at least two years of professional experience and statements of purpose for consideration. The Utah-based private research institute maintains a campus in Idaho that oversees all distance education offerings. The fully online BS in healthcare administration is designed to prepare graduates for entry-level positions in healthcare management, advance the careers of allied health professionals who hold associate degrees, and provide a solid foundation for postgraduate study. Because BYUI’s offering is a degree completion program, students are expected to have completed between 50 and 60 credits at a BYUI-affiliated school or other accredited institution before applying. Students take between 66 and 69 credits to fulfill the 120-credit requirement for graduation. Major subjects include managing healthcare provider organizations, incorporating technology in healthcare management, program evaluation, healthcare strategy, and the healthcare insurance industry. Students also participate in a one to three-hour internship at a site near their home that has been approved by the department. Areas where BYUI graduates can be found include public health management, health insurance organizations, urgent care centers, rehabilitation centers, long-term care facilities, and consulting firms. The program is available entirely online, making it easy for students to balance their professional and personal lives. Courses are offered year-round, making it possible to accelerate completion of this online healthcare management degree. Students may take up to eight years to finish their studies. All study is asynchronous. Online students are expected to meet the honor code and maintain ecclesiastical endorsements as required by the Latter Day Saints. UAB’s bachelor of science in healthcare management degree prepares students with the core knowledge and skills needed to thrive in health-related careers. Students can choose from six specialization tracks, each with its own course of study and academic requirements. This program receives certification from the Association of University Programs in Health Administration, which sets quality standards for some of the best healthcare management schools online. All students in this program must earn 120 credits to graduate with bachelor’s degrees, normally through four years of full-time study. Candidates take core classes that cover statistics, healthcare laws, economics, medical terminology, and computer applications. The general manager track endows learners with a broad base of managerial skills relevant to health industries. The clinical manager track, normally for those already working in related roles, helps candidates further their careers providing care in clinical settings. The long-term care administrator track prepares students to work in residential care facilities. The pre-professional track gives candidates who plan to earn master’s or doctoral degrees the foundational knowledge they need to continue their studies. Two further fast tracks provide efficient ways for candidates to earn undergraduate and graduate credits concurrently, so they can complete master’s degrees in one further year of study. One prepares students to go on to earn a master’s in occupational therapy, and the other prepares candidates for a master’s degree in health informatics. Prospective students apply with high school or college transcripts and ACT scores. The general manager and clinical manager tracks require candidates to prove a GPA of 2.5 or better. The long-term care and pre-professional tracks require a GPA of at least 2.75. The occupational therapy fast track asks candidates to prove a GPA of 3.0 or better, and the health informatics fast track program requires a GPA of 3.2 or better. At East Carolina University, aspiring healthcare administrators can enroll in the online bachelor of science in healthcare services degree completion plan. This healthcare management degree online is designed for pre-professional students in the allied health fields who have earned two years of credits at a community college, or for working professionals returning for a bachelor's degree. ECU's program prepares students for leadership roles in healthcare or further study in a master's program. Students who go directly into the workforce after graduation are qualified for mid-level management positions in home healthcare, healthcare research and development, and clinical settings. The allied health management concentration is designed for working professionals who already hold allied health credentials and seek advancement in the workplace. Applicants to this healthcare management degree online must have completed at least 33 semester hours of academic credit, but are able to transfer up to 63 from an accredited four-year institution. The allied health and health services management concentrations require students to complete 126 hours to qualify for graduation. Students complete a semester-long internship during the fall of their junior year, and program administrators are on hand to help them find a suitable site near their place of residence. Students must earn a minimum grade of "C" in all foundation classes. Courses include health information management, leadership in healthcare, and healthcare payment systems. The department is home to a range of scholarship programs for eligible students in health services management, including the College of Allied Health Sciences Alliance for Excellence Scholarship, the SGM Herman J. Kennedy Memorial Scholarship, and the Louise O. Burevitch Scholarship. ECU offers networking and career development opportunities through the ECU chapter of the Future Healthcare Executives of America. Based in Joliet, Illinois, the University of St. Francis is a small, private Catholic college. The BS in healthcare leadership program at St. Francis is an online degree in healthcare management that’s designed to position credentialed allied healthcare workers for advancement into management roles. Students typically hold an associate degree and work as technicians, therapy assistants, technologists, or supporting staff before applying. Adults working in other fields may also use this program as a stepping stone toward entry into a healthcare administration career. Courses in this degree completion program focus on information management, accounting, human resources, health law, and other topics essential to management in a clinical setting. A minimum of 64 credits must be transferred at the time of matriculation; a maximum of 80 credits from an accredited community college or hospital-based program are allowed. The core healthcare management curriculum at USF consists of 50 hours, with additional electives available for students who have taken fewer credits before transferring. Because the program is designed for working adults, scheduling options are flexible. The entire program can be completed online, though students may opt for campus-based classes in the evenings or blended formats that mix online and traditional study. Online courses are deployed in seven-week, asynchronous study modules that allow students to complete two classes per semester. The university is sensitive to the needs of online learners and provides a range of support services. Technology assistance is available 24/7, as is access to library resources, career counseling, and academic advising. Prior learning credit may be awarded for work experiences or membership in the American Health Information Management Association. Dallas Baptist University is a private school that emphasizes the application of Biblical teachings within all working environments. DBU's online bachelor of arts and sciences in healthcare management completion program is designed for adults who are already employed in a clinical setting. The program's upper-level classes build on the fundamentals explored in the associate degree curriculum, emphasizing the business acumen necessary for leaders in the healthcare environment. It is expected that graduates are viable candidates for mid-level managerial roles in a variety of different healthcare settings. Up to 66 academic credits may be transferred to this online bachelor’s degree in healthcare management, other credits may be granted by examination or for work experience. Students must earn 120 credits to graduate. Allied health professionals who hold associate degrees may find DBU's inverted program appealing. Students in this program have completed a minimum of 24 credit hours of specialized technical or occupational training and can pursue general education and major core requirements to complete a bachelor's degree. Courses include principles of management, organizational behavior in healthcare management, legal issues in healthcare management, and healthcare ethics. An internship at a healthcare site is not a requirement, but administrators are available to help interested students find suitable locations to gain hands-on experience. DBU recognizes that many students applying to this program are also juggling personal and professional responsibilities, therefore all studies are conducted asynchronously. DBU is a Christian school, and all students are expected to complete each program’s religious studies component. Regis University, a private Catholic institution in the city of Denver, offers a bachelor of science in healthcare administration that can be earned completely online. Designed for working professionals who have previously earned some college credit, the online bachelor's degree in healthcare management can usually be completed in 24 to 30 months. While the program is ideal for professionals who hold allied healthcare credentials, many students enter with business or administrative experience in healthcare. Graduates are equipped with the skills to effectively manage within a clinical setting. Graduates are prepared for careers as healthcare administrators, clinical managers, practice administrators, nursing home administrators, and hospital administrators. Regis’ program is offered as a degree completion program or a full degree. General education requirements total 48 to 51 credits, while the core healthcare management requirements comprise 66 to 75 credits. Students need 120 credits to graduate. Learners will cover topics including assessment of quality care and patient safety, managing healthcare services reimbursement, healthcare informatics and information systems, and research methods within the industry. Students also complete an administrative internship lasting three hours during their final year. Classes are taken in eight-week modules, and all study is asynchronous. Courses may be taken year-round, with start times in January, March, May, August, and October. Regis limits its online class sizes, allowing distance learners to develop connections with faculty and peers. Transfer credits are evaluated on an individual basis; lifetime learning and competency-based credits may be granted to eligible students. Regis University is accredited by The Higher Learning Commission and is a member of the North Central Association. Located in Lynchburg, Virginia, Baptist-affiliated Liberty offers a bachelor’s in healthcare management online program that teaches students the skills needed in professional healthcare office roles. Candidates learn fundamental business administration principles, then explore topics relevant to the healthcare industry. Students complete this program through asynchronous online courses, meaning they can learn wherever and whenever they prefer. This bachelor of science in business administration: healthcare management degree requires students to earn 120 credits to graduate, which typically takes four years of full-time study. Students take general education classes in English, math, information literacy, and Christian thought. Degree candidates take major foundational courses that cover organizational behavior, statistics, and business computer applications. Major core classes explore business administration topics, such as accounting, economics, law, human resources, and organizational planning. Healthcare administration courses focus on legal and ethical issues in healthcare, research and evidence, healthcare informatics, and grants. Liberty provides many support services for its online students to succeed. Academic advisers help students plan courses of study that match their interests. Remote learners can access the university’s library databases online. Students who seek individual instruction may use writing support and tutoring services. The university offers preparatory classes to help students get ready to complete this rigorous course of study. Liberty’s career center helps students locate relevant internship and work opportunities. Prospective students apply with GED records, high school transcripts, or college transcripts. Liberty encourages all candidates to complete FAFSA forms to determine eligibility for financial aid. Candidates can submit ACT or SAT scores if they choose, but Liberty does not require standardized test scores. Liberty allows undergraduate students to apply up to 90 credits from other regionally accredited institutions to this degree. Transfer students must prove a GPA of 2.0 or better in all college-level classes. WGU, based in Salt Lake City, Utah, offers a healthcare management degree online that teaches the competencies needed in healthcare administration roles. Students in this program learn the skills required to lead organizational efforts in the healthcare industry. Students complete this course of study through asynchronous online classes, meaning they can learn whenever suits their individual schedules. WGU encourages student success with support resources. Students work closely with program mentors to make professionally relevant coursework selections throughout the degree program. Distance learners seeking enriched instruction can access web-based tutoring. The university’s technical support center helps online learners overcome technology challenges. WGU’s career services office helps match students and alumni with professional opportunities relevant to their career goals. This bachelor of science in business - healthcare management degree requires candidates to earn 120 credits through 40 classes. Some classes allow accelerated study. Candidates take general education classes in English, science, math, and social science. Students learn business administration skills through courses covering economics, business law, marketing and business communication, ethics, and information systems. Candidates in this program take courses in healthcare systems and laws, technological applications, research, and healthcare operations management. Students complete capstone courses that allow them to integrate learned skills and answer complex questions about healthcare administration issues. At WGU, programs begin on the first of each month, meaning students can start their studies whenever works best for them throughout the year. Prospective students apply with GED records, high school transcripts, or college transcripts. The university encourages all applicants to complete FAFSA forms to determine eligibility for financial aid. WGU requires applicants to take readiness assessments. WGU accepts transfer credits from regionally accredited institutions. The university also maintains articulation agreements with community colleges in the region to help transfer students with associate degrees complete their undergraduate studies at WGU. Ottawa was established as a private liberal arts university during the Civil War. Two online degrees in healthcare management are available through the school. The clinical track is designed for healthcare workers who have already undergone professional clinical training in an allied health specialty and now seek the necessary business knowledge. Concentrations available in this track include communications, economics, finance, human resources, leadership and management, and marketing. The non-clinical track is ideal for students who seek career advancement in healthcare management or administration but lack clinical credentials. While the same concentrations are available, more emphasis is given to providing students with the tools needed to gain organizational insight and advanced leadership skills. Alumni can be found in many healthcare settings, including hospitals, nursing homes, ambulatory services, group medical practices, residential care facilities, and home health agencies. Both tracks require distance learners to complete 124 credits, and Ottawa maintains a generous credit transfer policy designed to maximize prior learning; up to 80 semester hours may be applied toward this healthcare management online degree. All required courses are available completely online and are also taught asynchronously to allow for self-directed learning. Students have the opportunity to combine their degree with more than 20 minors. Related minors include business administration, communication, marketing, and human resources. The university maintains an impressive 4:1 student-to-faculty ratio that ensures close collaboration with faculty and fellow students while also allowing for individualized learning. A host of support services are also made available to distance learners. Concordia University in Saint Paul is a liberal arts institution founded in the late 1890s in the Lutheran tradition. The university’s BA in healthcare administration degree can be earned entirely online. The program is designed for working adults who already hold an associate degree or have some college credit. Distance learners should be able to transfer a minimum of 80 credit hours from their previous education. The program comprises 40 credit hours, with focused studies on health and medicine. Topics covered include epidemiology, finance in healthcare, leadership skills, law and ethics, human resources management, and regulatory compliance. Graduates are prepared for supervisory roles in healthcare and healthcare-adjacent industries. The online program mimics the on-campus curriculum, allowing students to interact with peers and professors. The accelerated nature of this program makes it possible for even working professionals to complete the degree requirements quickly. All online courses are delivered in seven-week sessions, so students can get through more classes each semester than if they were following a traditional schedule. And because all courses are taught asynchronously, students don’t have to worry about logging in at specific times. Once admitted to the online healthcare management degree, students are guaranteed that their tuition will not increase throughout their time in the program. Degree completion time is dependent on a student's previous academic experience, but most finish the program in two years or less. Ninety-two percent of students find work after graduation. Applicants must have a minimum 2.0 GPA. If students have less than 20 college credits they must also submit high school transcripts. Based in Melbourne, Florida Tech allows students in its online business administration program to focus on healthcare management. In this course of study, students learn about the structure of healthcare services and the laws that govern healthcare administration in the United States. Degree candidates practice the leadership and communication skills they need to thrive in health-related business roles. Online classes delivered in an asynchronous format allow learners to study whenever they want. This healthcare management program receives specialized accreditation from the International Assembly for Collegiate Business Education, which sets standards for top online colleges for healthcare management. This bachelor of arts business administration healthcare management degree requires learners to earn 121 credits. Online students take a class in distance learning to help them get the most out of this online degree. Students take classes in humanities, social science, and science to cover general education requirements. Major core courses teach business administration fundamentals including statistics, accounting, global business, economics, and decision methods. Candidates choosing to concentrate in healthcare management complete classes that explore community health evaluation, healthcare organization structures, and quality improvement methods in healthcare. Florida Tech encourages student success with robust support services. Faculty advisers help students progress through their courses of study. The academic support center provides subject-specific tutoring and writing instruction. Florida Tech’s information technology office works with students to resolve technical issues. The career management office helps students and alumni access job opportunities aligned with their individual career goals. Prospective freshmen apply with GED records or high school transcripts and ACT or SAT scores. Applicants with 24 or fewer college credits supply high school and college transcripts. Candidates with 24 or more transfer credits send college transcripts rather than high school records. Florida Tech grants transfer credit for classes completed with grades of C- or better at other regionally accredited institutions. Based in central Kentucky, Midway University is a small, private school that offers a selection of online bachelor's programs. Among them is one of the best healthcare management degree online programs in the state. Offered as an exclusively online BS in healthcare administration, Midway’s program helps students develop the fundamental business acumen necessary to lead in a dynamic work environment. The curriculum is designed for working or entry-level students who seek careers in healthcare management, as well as students preparing for postgraduate study. The 120 credit program is divided into general education requirements (34 hours), major course requirements (33 hours), supporting courses (30 hours), and electives (20 hours). Distance learners encounter topics including health insurance claims management, medical care delivery systems, supporting health communities, and financial management of healthcare organizations. Distance learning is conducted mostly in eight-week sessions, though some classes may be in a four-week or six-week format. An accelerated program is offered to reach graduation faster. The school offers students five start times throughout the year. Working students may also be able to receive prior learning credits. Although Midway is a private institution, the school offers low rates of tuition for all students, both in and out of state. For the 2016-2017 academic year, the cost was $415 per credit hour. Prospective distance learners can take a virtual tour of the campus or take part in a webinar with program faculty and administrators to learn more about the program. George Washington University offers more than 100 degrees though its distance education division. The BS in health sciences in clinical management and leadership program is a popular option for adults working in healthcare due to the flexible nature of the degree. Many allied health professionals hold associate degrees, and returning to school for an online healthcare management degree can increase their career mobility or prepare them for graduate studies. The curriculum delivers instruction on the business of healthcare, including topics such as financial management, informatics, quality assurance, bioethics, and human resource management. Graduates are prepared for leadership roles in clinical settings. The program is currently under redesign and will begin accepting new applicants soon for the fall of 2018. The program takes two to three years to complete, and students cover a variety of broad topics, including administration functions, consumer needs, the changing face of healthcare, communication skills, and leadership and group effectiveness. The curriculum is in the process of being redesigned to ensure that students continue to gain cutting edge instruction that’s attuned to the changing face of the industry. Graduates of associate programs in allied health and traditional students who demonstrate 60 credit hours of study can complete this bachelor's degree entirely online. GWU's guaranteed admission agreements with several local community colleges can expedite the admissions process. Non-traditional credit sources are also considered on a case-by-case basis, including military coursework, credit-by-exam, and health programs based outside the traditional college structure. For students who plan to pursue graduate study, GWU's dual degree program allows completion of the bachelor's plus three graduate courses that count towards a master’s degree in the discipline. Students enrolled in both programs can expect to finish both degrees more quickly than if they were taken separately. NU, headquartered in La Jolla, California, offers a healthcare management online degree that prepares students for health industry administrative roles. This course of study provides candidates with broad understanding of the healthcare industry, including the structure of health services, laws that govern health businesses, and methods of healthcare finance. Students practice the project management, communication, teamwork, and leadership skills needed to succeed in healthcare administration careers. Delivered entirely through asynchronous online classes, this degree allows learners to study where and when they want. This bachelor of science in healthcare administration degree requires candidates to earn 180 quarter units, which typically takes four years of full-time study. Students in this program take general education classes in writing, speech, mathematics, science, social science, humanities, health, and information technology. Program preparatory courses include healthcare terminology, culture and health, epidemiology, and biomedical statistics. Core courses cover health informatics, politics and policy, organizational management, marketing, budgeting and finance, and healthcare law. All students in this program take a capstone course that applies program knowledge to current healthcare topics. Degree candidates also participate in internships to gain real experience in health-related professional roles. The university encourages student success through generous support services. The university’s help desk assists online students with technical difficulties. NU offers students who want additional instruction tutoring in math and writing. The university’s academic success center teaches the study and research skills students need to succeed in the higher-level classes required for this degree. Career counselors match NU students with internships and jobs relevant to individual career goals. Freshman applicants supply GED records or high school transcripts.Students without college experience in math and English must take placement tests. Transfer students apply with college transcripts. Applicants must prove a GPA of 2.0 or higher. NU offers transfer credit for some forms of professional experience, including military training, and by exam. Cleary University was founded in 1883 as a business school and continues to fulfill its mission by providing business-based educations. Based in Flint, Michigan, the school offers a range of distance education programs to learners outside of the state. Cleary's bachelor of business administration in healthcare management is an online degree completion program that prepares healthcare professionals for management and administrative leadership roles. The degree is open to current students or credentialed professionals who hold an associate degree. This healthcare management degree online curriculum emphasizes business skills, planning and strategy, management, ethical leadership, and current trends in the industry. The program is designed to be taken on a full-time basis, with most semesters requiring 15 credit hours to complete the mandated 120 credits within four years. Courses include healthcare informatics, marketing healthcare services, healthcare business and policy, and managing projects and processes. Students also complete a professional culminating project during their final spring semester. Cleary's transfer policy allows up to 90 credit hours from an accredited school. The school's small size allows for an 11:1 student-to-faculty ratio. The program is taught on a cohort basis, meaning distance learners will enter the program at the same time and progress through their classes together to build strong educational and professional bonds. Incoming students enjoy the benefits of tuition being frozen for up to 12 consecutive terms. This allows working students to complete the degree on their own schedules without financial penalty. Students must demonstrate two years of professional or management experience. Based in Nebraska, Bellevue coordinates an online degree in healthcare management that prepares candidates to work in the rapidly changing healthcare field. This degree teaches the business administration and healthcare knowledge needed to succeed in health-related business roles. The program emphasizes project-based learning and gives candidates opportunities to apply theoretical knowledge. Online classes delivered asynchronously allow learners to study when they want. However, the program encourages students to work with others in their cohort, so learners may need to interact online at specific times. This bachelor of science in healthcare management requires candidates to earn 127 credits. Students bring at least 60 college credits to the program, and can finish the degree in 72 weeks of accelerated, full-time study. Students must complete 36 credits in general education classes and 51 credits of electives. All students must take three classes covering American values, freedom and responsibility, and tradition and change. Degree candidates earn 40 credits through major courses which cover legal issues, human resources, marketing, fiscal management, and health information technology. Students participate in capstone courses that explore healthcare topics and allow candidates to apply the knowledge learned through the program. Bellevue facilitates student success with dedicated support services. Academic advisers help students plan courses of study that match their schedules and interests. Distance learners who need extra instruction can access online tutoring. Career specialists help students transition to professional roles. This degree typically accepts students who already hold 60 credits from another accredited institution with a GPA of at least 2.0. Prospective students supply college transcripts. Candidates without previous college experience may earn the prerequisite 60 credits at Bellevue before gaining full admission to the healthcare management program. The university also maintains articulation agreements with more than 150 colleges to facilitate smooth transfer to Bellevue. Charter Oak, located in New Britain, Connecticut, offers an online bachelor’s degree in healthcare management that helps candidates start or advance careers in health-related business roles. This course of study teaches students about the structure of healthcare services in the United States, laws governing the healthcare industry, and economic factors that influence care decisions. Students practice the communication, collaboration, and leadership skills they need to thrive in healthcare management leadership roles. Candidates complete this degree through online asynchronous classes. However, the college encourages peer collaboration, and learners may occasionally need to participate in online discussions at specific times. This bachelor’s healthcare administration degree requires candidates to earn 120 credits. Students complete general education requirements through classes in English, math, social science, science, and humanities. Major core courses explore topics in economics, health systems and administration, human resources management, statistics, and medical terminology. Degree candidates complete capstone courses where they apply learned skills to researching health-related topics. The college helps students succeed with support services. Students work with academic counselors to plan courses of study that match their learning needs. Learners who seek extra instruction can access online tutoring. The college’s tech support center, open at all hours of day and night, assists with technical matters. The career services office helps students develop resumes and apply for jobs in their chosen career paths. Applicants supply high school and college transcripts. Prospective students must typically hold at least nine credits from an accredited higher educational institution and prove a GPA of at least 2.0 to gain admission. Charter Oak grants transfer credit for courses completed at other accredited institutions. The college requires transfer credit in major courses to come from classes passed with grades of C or better. Charter Oak grants transfer credit by exam and for some forms of professional training and relevant life experiences. A Catholic institution based in Toledo, Mercy organizes an online degree in healthcare management that endows learners with the management skills and foundational knowledge of health industry structure required for healthcare administration roles. This degree emphasizes the critical thinking and clear communication competencies needed to lead business operations. Candidates complete this degree through online classes delivered asynchronously, so they can study whenever they prefer. However, the college encourages peer collaboration, and students may occasionally need to communicate with their peers online at prearranged times. Mercy’s 120-credit bachelor of science healthcare administration degree requires candidates to take general education classes covering English, math, social science, science, and humanities. Major classes focus on the structure of the healthcare system, healthcare economics, accounting, human resources, information systems, and population health. This program also requires degree candidates to complete a practicum to gain experience in real healthcare administration settings. However, the college waives this requirement for students who already work in health-related fields. Mercy helps students succeed with support services. Learners who seek additional academic support can access subject-specific tutoring and help with writing. The college’s career and professional development center helps students and alumni write resumes, practice interview skills, and locate professional opportunities matching their career goals. Prospective students must hold a GED or high school diploma. The program typically requires prospective students to hold associate degrees or have earned 60 credits of college-level coursework. Applicants must prove completion of required general education courses and a GPA of 2.3 or better. Mercy accepts transfer credit for courses passed at other accredited institutions. Degree candidates transferring from other institutions must complete at least 36 credits while enrolled at Mercy. Pennsylvania State University offers aspiring healthcare managers the BS in health policy and administration program. This four-year healthcare management online degree delivers a comprehensive education on issues surrounding healthcare. Students explore relevant topics like health insurance policy, organizational behavior in healthcare, microeconomics of healthcare delivery, sociopolitical factors in healthcare administration, global healthcare policy, and more. Graduates are equipped to be leaders and change agents in the industry. The university recognizes that healthcare is an evolving and growing industry and works to incorporate dynamic technologies while also being aware of changing regulations and the rising costs of healthcare. Students learn the ins and outs of managing these complicated systems by studying theory and taking part in real-world learning experiences. More than 4,000 students have already completed their online degree in healthcare management, creating a large and diverse network of alumni to aid current students and recent graduates in their professional pursuits. Emphasis is placed on preparing students for myriad roles based on their individual interests. Alumni can be found in settings that include more than 1,000 bed teaching hospitals and solo practice physician offices in rural locations. Though all classes are online, students are expected to complete a one-semester practicum experience at a healthcare facility or other approved location. Most applicants are recent high school graduates, but transfer credits may be accepted from accredited postsecondary institutions. All distance learners need to earn 120 credits to graduate. Online courses follow a semester calendar and are mostly asynchronous. Distance learners may begin their studies in the spring, summer, or fall. PSU has been a leader in online learning since 1998 when the school launched its World Campus. A Seventh-day Adventist institution located in California, Loma Linda organizes a healthcare management degree online program that allows students with previous higher educational experience to complete their undergraduate studies with a specialized focus on healthcare administration. Students learn the leadership, emotional intelligence, and organizational strategy skills required for mid-level administrative roles in the healthcare field. Students complete coursework required for this degree mainly through online asynchronous classes, meaning they can study when they prefer. However, students may occasionally need to participate in live online discussions. This bachelor of science healthcare administration degree, for candidates who already hold 96 credits from other higher educational institutions, requires students to earn an additional 96 credits to graduate. The program typically takes learners two years to complete. Students take general education classes in humanities, social science, science, and communication subjects. Major courses cover emotional intelligence and leadership skills, healthcare research, statistics, information systems, human resources, and marketing. Students must take religious studies classes. Learners may explore other topics of interest through electives. Degree candidates develop senior portfolios demonstrating the competencies they learn in this course of study. The university helps students succeed with ample support services. Faculty advisers guide students as they progress through their studies. The university organizes peer tutoring to help students who need extra instruction. Prospective students apply with GED records or high school transcripts and college transcripts proving at least 96 credits completed at other accredited institutions. Applicants must show a GPA of 2.5 or better in all courses completed in freshman and sophomore years, and the university only grants transfer credit for classes completed with grades of C or better. Applicants must also supply three letters of recommendation from academic or professional references. NMC, located in Omaha, Nebraska, offers an online degree that teaches the business skills needed to run health-related offices. Students learn how clinics, hospitals, and private practices function as organizations. Based on their individual learning goals, candidates choose to focus on leadership, education, healthcare administration, community health, or interdisciplinary approaches to healthcare administration. Students in this program can also minor in healthcare Spanish or healthcare American Sign Language, options not often available through other healthcare management online degree programs. This hybrid course of study combines online and campus-based learning. This bachelor of science in healthcare administration degree requires students to earn 120 credits, which typically takes four years of full-time study. Students earn 45 credits through general education classes that cover English, math, science, social science, and humanities. Business core courses account for 36 credits, and cover health systems, human resources, accounting, economics, healthcare laws, and information management. Students then take 21 credits in their chosen specialization areas, often through online classes delivered asynchronously. Degree candidates earn 18 credits through electives, which can include the aforementioned languages for healthcare settings. NMC encourages students to succeed with a variety of support services. Academic advisers guide students as they progress through their chosen courses of study. Tutoring professionals assist learners seeking additional instruction. Educational technology support staff members help students optimize online learning experiences. Career counselors help students and alumni find relevant jobs in healthcare fields. This program offers two start dates per year, in August and January. Applicants send high school transcripts proving a GPA of 2.5 or better. The college also requires incoming freshmen to supply ACT or SAT scores but waives this requirement for students who graduated from high school more than two years prior to applying to NMC. Transfer students must supply college transcripts. NMC accepts transfer credit from classes completed at other accredited institutions. The college maintains articulation agreements with colleges throughout the region. The healthcare management online degree coordinated by CityU endows learners with a broad understanding of the financial and legal framework of the health industry in the United States. This degree prepares candidates to thrive in the growing and changing healthcare industry. Students in this program learn relevant, practical skills from working healthcare professionals. Program graduates often go on to fill leadership roles in private or public health organizations. CityU delivers coursework for this degree asynchronously, meaning students can study whenever their work schedules permit. This bachelor of science in healthcare administration requires candidates to earn 180 credits. Online learners earn 90 credits through lower division classes in English, math, humanities, science, and social science. Students in this program earn 10 credits through preparatory classes in critical thinking, ethics, and leadership. Healthcare administration core classes supply 50 credits, covering legal and ethical issues, informatics, politics and policy, marketing, human resources, budgeting, and quality assurance. Electives, accounting for 25 credits, allow students to explore subjects that match their learning interests. The program culminates with a five-credit capstone course, in which students demonstrate an understanding of program competencies by researching topics pertaining to the future of the healthcare industry. CityU facilitates positive learning and career outcomes through student support services. Academic advisers work with students to reach individual educational goals. Library professionals guide online students as they conduct research. The university’s career center helps students and alumni develop resumes, practice interviewing skills, and locate rewarding professional opportunities. Prospective candidates apply with GED records or high school transcripts and essays describing educational goals. Applicants with previous college experience also supply undergraduate transcripts. The university maintains generous transfer credit policies, and allows transfer students to apply up to 135 credits to their degree at CityU. The university also awards transfer credit for prior learning in professional or volunteer roles. The University of Minnesota consists of five campuses scattered throughout the state. UMC currently caters to approximately 2,000 students, thereby giving it a much more communal feel and the opportunity for personalized learning. The university’s BS in health management is designed for first time students and working allied health professionals who are seeking career advancement. This healthcare management degree online takes a broad approach to the discipline by combining the theory and practice of healthcare management with the business skills that are essential to successful leadership. Throughout the 120-credit program, students learn about all the skills and knowledge needed to thrive in a managerial role. Courses include healthcare and medical needs, administration of the long-term care system, performance improvement, regulatory management, and healthcare law and biomedical ethics. During the final semester, distance learners complete a capstone course that combines their learning into a project. Graduates are prepared for healthcare management roles in clinical settings, corporate industry, and the government. They are also prepared to complete graduate-level educations. First-time students can expect a traditional four-year course plan; transfer students can finish more quickly depending on transfer status. While degree requirements can be met through asynchronous distance education, all students are required to complete a 10-week, hands-on practicum experience at an approved healthcare organization or clinical facility. Distance learners are eligible for the university's study abroad program and are encouraged to participate. Students who complete this program are automatically eligible for licensure as nursing home administrators in the state of Minnesota. UL Lafayette offers a healthcare management degree online that prepares students to work in health-related administrative roles. This program endows candidates with broad knowledge of the structure of health institutions in the United States. Learners explore emerging trends influencing the healthcare industry and practice the skills needed to succeed in healthcare jobs. The school allows candidates to study where and when they choose by delivering all coursework for this online degree asynchronously. This 120-credit bachelor of science in health services administration typically takes four years of full-time study to complete. Students take general studies courses in English, math, science, social science, and humanities. Candidates learn business skills through classes that cover human resources, finance, organizational management, and statistics. Health administration classes teach students about medical terminology, health information, health records, epidemiology, disaster management, and mental health topics. UL Lafayette ensures online student success through ample support services. Academic advisers guide students as they progress through the program. Students who seek additional instruction can access online tutoring resources. Library staff members help online learners conduct research. The career services office helps students develop resumes, practice interview skills, and locate rewarding professional opportunities. This program offers three start dates per year (in January, June, and August) so students can begin their studies when most convenient for them. Freshmen applicants apply with GED records or high school transcripts and ACT or SAT scores. They must also prove an overall GPA of 2.0 or better, with a GPA of 2.5 or better in core secondary courses in English, math, social studies, science, art, and foreign language studies. Transfer students who hold at least 24 credits from other higher educational institutions apply with college transcripts showing a GPA of 2.25 or higher. Transfer students must demonstrate completion of introductory college-level courses in English and algebra. Western Kentucky University, a public institution located in Bowling Green, is a four-year institution that’s currently home to more than 20,000 students studying on campus and through online education. The university has recently expanded distance education offerings and launched its healthcare management online degree in the fall of 2016. Offered as a BS in healthcare administration, this bachelor’s degree completion program requires a minimum of 74 credits. The program is ideal for credentialed allied health professionals or students who have completed a related associate degree at an accredited institution. The program focuses on teaching relevant healthcare skills, allowing graduates to quickly find jobs. The program has a high rate of employability. Students learn about the business functions related to healthcare management, such as human resource management, organizational structures, marketing, finance, and management. Specialized topics include long-term care administration, nursing facility management, contemporary healthcare issues, and international comparisons of healthcare systems. Students who have met all the prerequisite and general education requirements can expect to finish this program in two years, with a summer session between their third and fifth semesters. Schedules follow a traditional 16-week format and allow learners to complete assignments and tune in to pre-recorded lectures at times that are suitable to individual needs. WKU’s program holds certified undergraduate membership with the Association of University Programs in Health Administration. A long-term care administration certificate is available to students and is accredited by the National Association of Long-Term Care Administrators Board. The University of Maryland-University College gives learners the opportunity to earn a degree online. Students can take classes in person at regional locations in Maryland, Virginia, and the District of Columbia. UMUC maintains standing as a virtual college with a comprehensive portfolio of undergraduate degrees. The 120-credit bachelor of science in health services management heavily relies on the input of industry experts and scholars. The curriculum trains managers versed in finance, facilities management, and strategic planning. The degree has a general education requirement. The major includes the study of healthcare policies, healthcare financial management, management in healthcare organizations, and research and data analysis in healthcare. A notable course grooms managers who can apply management principles to ensure the successful operations of hospitals and ambulatory care centers. The capstone focuses on strategic planning and leadership as it challenges learners to think analytically and critically as they apply knowledge acquired throughout the program. The program's generous number of electives allow students to pursue a minor and/or concentration in healthcare. Gerontology remains one area that continues to spark student interest. The school's chapter of Sigma Phi Omega, a national honor society in gerontology, recognizes academic excellence and provides a forum for networking between undergraduates, educators, and practitioners in the field. The school accepts up to 70 transfer credits from a two-year institution or 90 transfer credits from a four-year institution. The school has no-cost electronic textbooks and other online resources that replace textbooks, which helps students save money. Admission requirements include a high school diploma or GED; no SAT or ACT scores are required. National Louis University stands as one of the oldest and most progressive colleges in Chicago. NLU's two colleges offer 60 programs to 7,500 students. Most of the school's students study part-time on one of six campuses in Illinois or Florida. Seven online options accommodate the needs of distance learners across the country. Among the school's online offerings is a bachelor of science in healthcare leadership. Faculty deliver the program completely online or in a blended format, which requires on-campus study in Florida or Illinois. The degree prepares professionals to begin administrative careers in hospitals, clinics, or private healthcare settings. Those already in the field acquire the training and skills necessary to advance into leadership roles. The 180-credit curriculum consists of 60 credits that are devoted to general education in subjects such as the arts, humanities, and social sciences. The program is taught in quarters. A gateway course on health delivery introduces the field by covering a number of topics, including the expectations of society, healthcare organizations, and the regulations that govern healthcare. Areas of study include strategic analysis and planning, team development in healthcare, healthcare information systems, and financial and physical resource administration. The program offers several concentrations: aging studies, entrepreneurship, leadership, international management, and urban and policy studies. A notable concentration in long-term care administration utilizes four courses to explore policies and regulations, resident-centered care, quality of life and care in nursing homes, and human resource and financial management of long-term care facilities. The concentration prepares learners for licensure from the National Association of Long Term Care Administrator Boards. All students acquire real-world experience through field trips, guest speakers, and work with real case studies. They receive mentoring from professionals in the healthcare industry who are also students in the master of healthcare administration program. Admission requirements include a high school diploma and transcripts. Drexel, a private research university with three campuses in the Philadelphia area, has an exceptional distance learning department. Launching its first internet-based program in 1996, the school developed Drexel University Online in 2001 to better serve degree seeking candidates. The school is also home to National Distance Learning Week, a collaborative program to help champion excellence in online education. The BS in health services administration degree is an exclusively online program tailored to the needs of working adults. Throughout the healthcare management online program, credentialed allied health professionals gain the advanced business skills that are essential to leadership roles in healthcare administration. The curriculum focuses on natural sciences, humanities, and business courses in addition to its core classes in business and administration. Topics covered within the major include healthcare laws, how healthcare facilities function as nonprofits, policy, and the marketing of healthcare institutions. Students complete 180 to 184 quarter credits, or the equivalent of 120 to 121 semester credits. Distance learners need to have completed a minimum of 24 credits with a grade of "C" or better at another accredited community college or four-year institution. The transfer policy allows students to transfer up to 90 credits. Students who already hold a certificate in medical billing and coding are also eligible to earn elective credit hours toward the degree. Students affiliated with local community colleges and healthcare systems that partner with Drexel enjoy significant tuition discounts. Online courses are taught asynchronously and delivered over four, 10-week sessions. Because the majority of applicants are already working in the field, this program is only offered on a part-time basis. Online students receive a 40% discount off the regular tuition rate. King University, a Presbyterian-affiliated college, integrates faith and academics on the school's campus in Bristol, Tennessee, and through online options. Degree programs provide learners with a comprehensive liberal arts foundation in addition to specialization in a range of fields. The school's growing online platform includes several degrees in healthcare. The 124-credit bachelor of science in healthcare administration uses a servant-leadership model to cultivate a cadre of professionals able to help shape the future of the healthcare field. Students can fulfill the general education requirements at King University or by transferring credits from an accredited institution. All students must complete at least 45 credits before being admitted to the major, which is one of the top healthcare management online degree programs in the nation. The 48-credit major includes the study of population-based health, organizational behavior and policy, management and leadership, and informatics for the healthcare leader. A course on sustainability in healthcare focuses on market share as students learn to identify target markets, develop healthcare products and services, and market products to consumers through advertising and promotions. Students learn about the factors that impact healthcare among diverse populations. Graduates have critical thinking and communication skills and understand the importance of ethical decision making. Learners with experience can elect to integrate their knowledge into the coursework. During the final semester, all learners develop a portfolio, which highlights their work. The portfolio contains a cultural transformation essay, a resume, and other artifacts that demonstrate mastery of the program's objectives. Full-time students can complete the major in 16 months. Online learners pay one tuition rate, regardless of in-state or out-of-state residency. Admission requirements include earning at least 45 credits with a minimum 2.2 GPA. Combining two of the most popular undergraduate fields, healthcare management online programs encompass a wide range of topics within healthcare and business. Not all bachelor's in healthcare management programs are the same, with many offering their own unique courses and concentrations. Other requirements, including number of credits, average completion time, cost, and career outlook, can vary from program to program. Most online healthcare management programs are offered as a bachelor of science degree and are taught through a school's business college. Health Informatics Health informatics describes the field within healthcare technology that involves managing data. Tech-savvy health management majors who choose a concentrate in informatics will learn about EHR/EMR, billing coding, and general administration information systems. Clinical informatic specialist, healthcare administrator, hospital billing professional, healthcare software analyst. Every healthcare management online degree comes with its own specific curriculum. While each online school has its own course requirements and offerings, many cover the same foundational subjects and concepts. The following subjects are taught as core requirements in most healthcare management online degree programs. Accounting: Accounting is at the core of management in many fields, especially healthcare. Administrators regularly act as liaisons with insurers, patients, physicians and hospital executives. As a result, foundational knowledge of proper accounting ethics has become a mainstay in every school's healthcare management curriculum. Health Systems: Before a student can learn how to manage a doctor's office or hospital, they must understand how the modern healthcare system works. Schools with a health systems concentration typically offer courses on the American and global healthcare systems. Operations Management: Operations management is a core principle of any business. From understanding the theory to putting it into practice, this course deals with how a healthcare system or facility can be operated and organized optimally. Health Information Technology: From EHRs to ICD-10, information technology is in every part of the healthcare system. All online degree healthcare management students learn the basics of IT and decide whether or not to pursue it as a concentration. Human Resources in Healthcare: This standard healthcare management core focuses on managing people, recruiting new employees and dealing with common healthcare personnel problems. HOW LONG DOES IT TAKE TO GET AN ONLINE BACHELOR'S IN HEALTHCARE MANAGEMENT? The average bachelor's in healthcare management online degree includes 120 credits and takes roughly four years to complete. Many of these programs include general education requirements and require students to choose a major and minor. Online students may be able to earn their degree faster if they are able to enroll in an accelerated program or apply extra credits from previous college education or college entrance tests. The biggest factors that determine time to completion are credit requirements, pacing of academic terms, whether a student studies full-time or part-time, and whether a program includes lengthy theses, residencies, or capstone projects. Attending an accredited healthcare management online program is an industry standard. Accreditation of a school or program means that it has been recognized as fulfilling various academic criteria designated by the government, peer institutions, and professional organizations. Schools can either be nationally or regionally accredited. Regional accreditation applies to most institutions and their online programs, while national accreditation applies to distance learning, vocational, and practical education colleges and universities. Regional accreditation in the U.S. is done by one of six groups recognized by the Department of Education and the non-governmental professional organization the Council for Higher Education Accreditation (CHEA). The CHEA is in charge of national accreditation and oversees several approved organizations that give out accreditation to schools based on multiple categories. In addition to national and regional accreditation, some programs receive their own forms of accreditation from subject-specific professional organizations. The Commission on Accreditation of Healthcare Management Education is one of the CHEA-recognized health care management organizations. Before applying, check the U.S. Department of Education's website to ensure that your prospective program is accredited. Historically, the healthcare industry's job outlook has always been high, due to the constant demand for qualified professionals in this field. Demand has grown in recent years, thanks to a sharp uptick in the number of patients requiring medical care in the United States. More than 20 million previously uninsured Americans now have medical coverage under the Obama Administration's Affordable Care Act, and an aging baby boomer population has also contributed to this increased demand for healthcare. As a result, industry projections in healthcare management are currently quite strong. Using data from the BLS, the following table looks at job growth predictions for some of the most common careers in healthcare management. The BLS also notes that the unemployment rate for healthcare support specialists, including administrative and managerial roles, is currently set at 5.7. By comparison, the national unemployment rate for all jobs is 4.9%. However, unemployment tends to decrease for healthcare management degree-holders after a few years in the workforce. A survey by the National Center for Education Statistics (NCES) revealed a 3.7% unemployment rate for college graduates between the ages of 25 and 29 with a bachelor's degree in general health and medical services. According to the BLS, the median annual salary for all 'healthcare occupations' is $62,610. Your earning potential in this industry will largely depend on two factors: the specific, healthcare-related bachelor's degree you earn and the number of years you have worked. The table below highlights salary expectations for different healthcare degree recipients at two key career benchmarks. All eight of these degrees lead to strong salary growth after 10 years. Degree-holders with a health-based degree get the highest growth projection, as they can expect their salary to climb 70.0% between their first job and mid-career. The average growth rate for all eight degrees is 54.9%. Other factors that will impact your salary expectations include your location, job description, and the size of your company. The following table looks at career salary growth projections for five common career pathways in healthcare management. All five occupations on the table saw at least 41% salary growth after 20 years in the workforce. Medical health and services managers saw the highest growth rate, a 51% increase between entry-level and late-career benchmarks. College students who leave school with a bachelor's degree in healthcare management will leave school qualified for dozens of entry-level positions, along with select managerial roles typically reserved for candidates who have earned an undergraduate degree. Below, we've reviewed four common career pathways for professionals with a healthcare management degree. Medical Records and Health Information Technicians: These professionals are responsible for collecting, organizing, and storing patient data at hospitals, clinics, and other healthcare facilities. This career path has become highly digitalized in recent years, and technicians must become familiar with key electronic billing and coding procedures. Medical and Health Services Managers: Also known as healthcare executives or healthcare administrators, these professionals oversee the various medical services offered at healthcare facilities. Some manage entire staffs, while others are concentrated in specific departments. Administrative Services Managers: These professionals generally oversee an organization's administrative operations. In healthcare facilities, administrative services managers typically handle medical recordkeeping, equipment maintenance needs, facility upkeep, and logistical demands. Health Educators and Community Health Workers: These professionals develop community-level projects and initiatives aimed at promoting positive health and lifestyle choices. They often meet with community leaders and members to research target demographics, and may also collect information through surveys and in-person interviews. Making connections and learning as much as you can about health care management is crucial to your professional success. Professional organizations offer a great entry point for students who want to learn more about their chosen career path. Below you'll find three of the country's most prominent organizations established for healthcare management professionals. These organizations host networking events, provide online trainings, maintain active job boards, and offer other services for career-ready college graduates. Association for Healthcare Administrative Professionals: AHCAP is a non-profit organization dedicated to healthcare management professionals. Members enjoy several benefits, including six free webinars per year, reduced tuition for continuing education opportunities, and an invitation to the organization's annual conference. Health Care Administrators Association: First formed in 1980, the HCAA supports educational opportunities, professional networking, and advocacy for third-party administrators in health and medicine, including insurance providers and health consultants. The association offers a Certified Self Funding Specialist certification. The website also features an online job board. American Association of Healthcare Administrative Management: Founded in 1968, AAHAM today oversees more than thirty regional chapters across the United States. The organization specializes in education and advocacy related to areas like medical reimbursement, patient registration, data management, and medical recordkeeping.